Bring the Wizard of Oz to life on Halloween by decorating with this rare discontinued Wicked Witch Tombstone! Features a familiar character villain’s grave marker as a victim of the falling house market, and includes two inflatable legs! 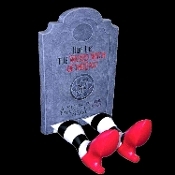 The gravestone of the Wicked Witch of the East is the perfect comical fantasy decoration for your Halloween graveyard haunted house yard cemetery! Includes: Tombstone, and Two inflatable legs. Tombstone - approx. 19-inch (47.5cm) H x 13-inch (32.5cm) W x 1.25-inch (3.13cm) D.
Legs - approx. 12-inch (30cm) Long. Tombstone - Dense Polystyrene Foam. Legs - Inflatable Vinyl Plastic.